The Professional Regulation Commission (PRC) announced on Thursday the results of February 2015 Physical (PT) and Occupational Therapist (OT) board exam. A total of 412 out of 766 have passed the PT and 54 out of 87 passed the OT board exam given by the Board of Physical and Occupational Therapy in the cities of Manila and Cebu this February 2015. PRC named University of Santo Tomas (UST) as the top performing school in the February 2015 Physical Therapist Licensure Examination as per Commission Resolution No. 2010-547 series of 2010. UST got 94.12 passing percentage or 16 out of 17 passed the exams. Silliman University (SU), Far Eastern University- Nicanor Reyes Medical Foundation and Remedios T. Romualdez Medical Foundation (RTRMF) ranked 2nd, 3rd and 4th respectively. For the February 2015 Occupational Therapist Licensure Examination, University of the Philippines (UP)-Manila took the lead with 100% passing percentage or 5 out 5 passed the tests. 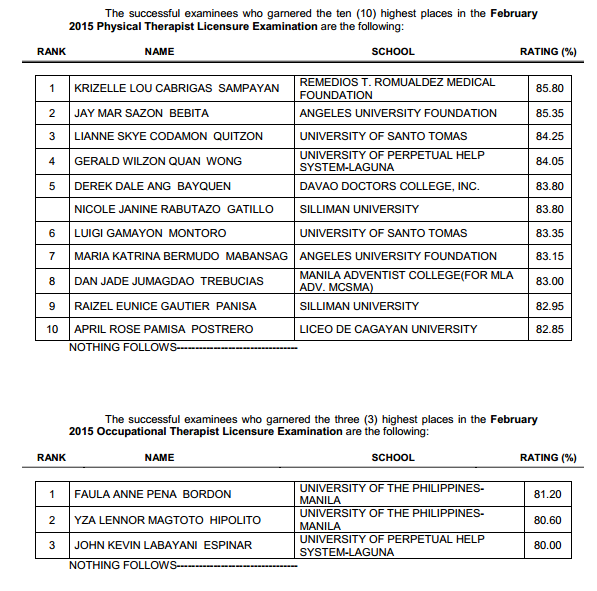 University of Santo Tomas (UST) and Cebu Doctor's University (CDU) follows at 2nd and 3rd spot respectively.